This is a revised version of a post I published a couple of days ago. I have modified it to take account of feedback. Fortunately, Debra quickly realised her mistake and changed the reply, to clarify that when she talked about “me” she actually meant “him”. Now in the original version of this post I assumed that the only way one person could replace another mid-discussion and refer to the other peson as “me” would be if they were, in fact, the same person posting under two names. Of course, if I’d thought it through then I would have to consider other possibilities, like two people who have shared access to their accounts, or two people using the same computer who haven’t checked who is logged in. What I didn’t actually expect, and what actually happened, was that Debra would construct a story to explain how she apparently typed as if she was somebody else. I’ll return to this a little later. But first, let’s look at why, at least for those of us who want credible debate in the world of Twitter, it would matter if Debra is also posting under a secret simian identity. If she were to be the gorilla, she would have accused me of being a bully and making personal attacks (presumably the Star Wars gag) while protecting myself and simultaneously used another identity to make far stronger attacks on other people. Fortunately, in case we were in any doubt, Debra did (after about 11 hours) come up with an explanation of why she accidentally tweeted as if she was somebody else. You can find the full text in the comments below, but here is the key excuse given. Firstly, I can absolutely see why it was that this made sense to you. It might help if I explain that I wasn’t simply writing me instead of him. But that the initial tweet had been much longer – like ‘Ah well, that’ll be the alpha male monkey in him if you ask me!’ but I decided it sounded a bit rude and was editing down. The ‘accident’ was not the me instead of him, it was pressing ‘tweet’ mid edit. I completely accept, however, that it seems dodgy and that decision will, of course be entirely down to the reader. Secondly, the tenor of my tweet was to defend Tessa from a series of comments which, although I did agree with their central point, did seem a little aggressive. I have always tried to maintain a level of professionalism in my tweets as you know. You may not know, that Tessa and I have been emailing over the past week as I’ve been helping her with some of her reading and frankly, I felt sorry for her. If you read the blogpost that sparked this debate you’ll see how unfair this attack is. 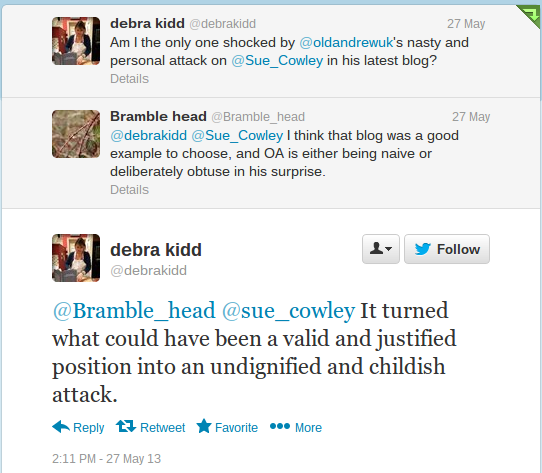 Well done Debra for objecting to this attack, no matter how it turned out. I… hang on a second, did I miss something here? Let me have a closer look at that comment from the gorilla, what’s that at the bottom? “Retweeted by Debra Kidd”? So, Debra was so concerned at this insulting tweet that she just had to jump in to protect Tessa, but only after she had retweeted it to her 1400 followers? Well, of course, I think we have all reacted to something objectionable and insulting by sharing it really widely; saying nothing to directly condemn it, and in the process accidentally implying that we are the author. I’m sure that’s a much more likely explanation than, say, that the author of the insulting tweet changed accounts in order to retweet what they had written, then when they returned to the discussion forgot to change accounts back. After all, while the first story makes no sense at all and relies on a ridiculous coincidence, it does at least make Debra out to be a good person. While the second version of events, while an everyday happening for inexperienced internet sockpuppets, suggests that Debra is not completely honest. It would only be charitable to assume that the former must be the case as I have been repeatedly assured that she is honest and trustworthy. 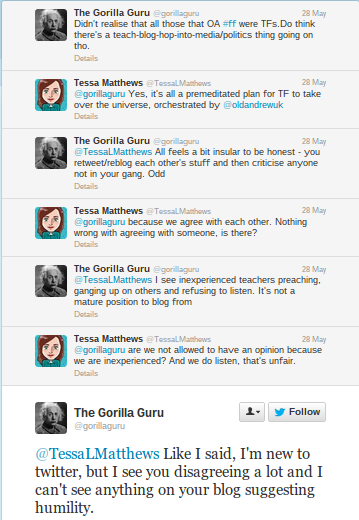 And who would doubt the complete integrity of the person who was responsible for this exchange? Look. There’s no way you will be accepted into the inner circle anyway. 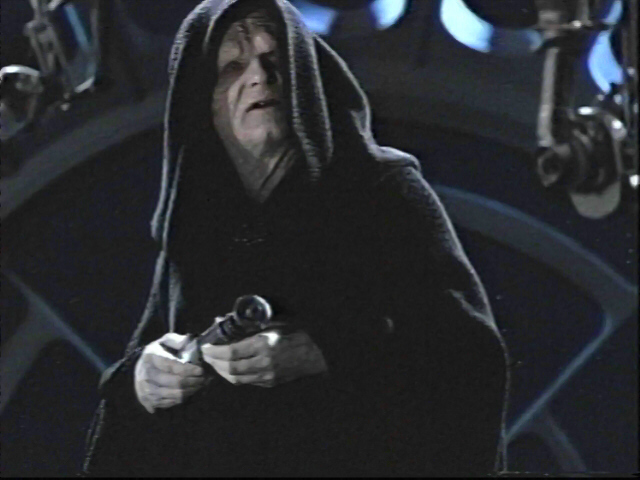 You are over the age of thirty; I only like young bloggers really. I accept a few older ones so I don’t get done for discrimination. They tend to look up to me. 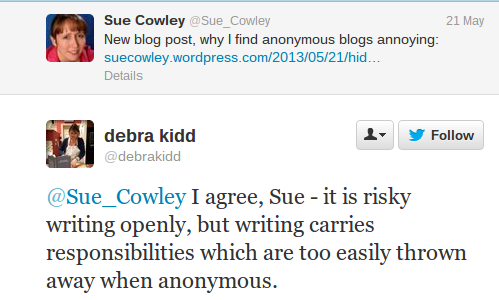 I’ve also had Sue Cowley ask that I remove a reblog of one of her posts from The Echo Chamber. In case you are not aware, a reblog is little different to sharing a link on facebook or Twitter, making this the one case I have ever encountered of a blogger wanting to avoid having their work advertised to a wider audience. As much as I like to take the mickey, and be as partisan as possible, I am left wondering if things have gone a bit too far here. Can’t we all just be more like Barney the Dinosaur? Or failing that, can’t we all just agree to pick on David Didau? Since I wrote this post almost 5 years ago, I have long since given up on the idea that an individual’s behaviour on Twitter is worth blogging about. 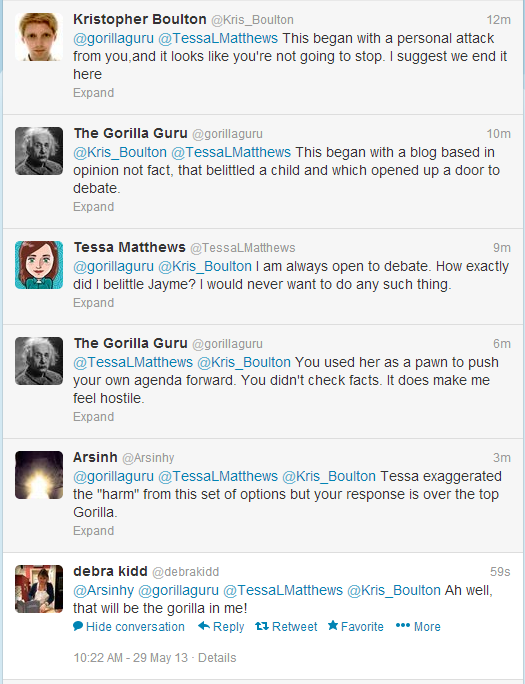 I now only comment when there is a pattern of behaviour by many different progressives. 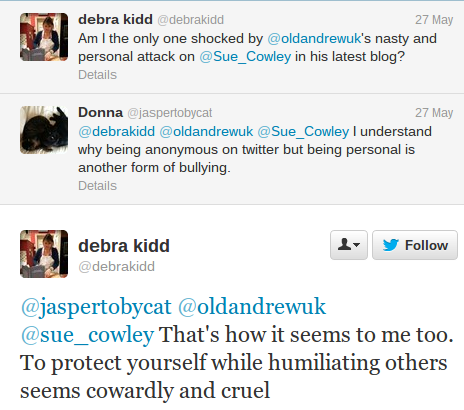 Since then, Debra Kidd has openly done many things I considered to be reprehensible. discussing whether people should complain about my opinions to my school governors. claiming to be a victim of child abuse, and using that as a platform to claim that people who stand up to her bullying or disagree with her, are lacking in compassion for her and those like her. However, there are a number of people who have told me that despite the evidence above, there is no way she’d ever have engaged in the sock puppetry, and she has never come clean about any of this. So it is probably worth noting that she has now admitted to being behind one sock account. Unfortunately she has now deleted that account, so I can’t demonstrate how offensive and dishonest it was (but I can say I blocked it without even knowing it was her). But at least with this confession we can finally say that we now have it in her own words that she sets up sock accounts and uses them to tell lies and confront people who would rather have nothing to do with her. I hope those who told me that, despite the evidence, she would never do such a thing get round to apologising. I thought this was excellent and worth reblogging here to reach as many people as possible.. There was an interesting response to my blogpost yesterday. It may have been a side effect of the bank holiday but it got the level of hits usually reserved for posts about OFSTED, most coming from Twitter where there was a certain amount of debate. A lot of people posted to support what I had said about anonymity, including plenty in the “I don’t often agree with Andrew, but he is right here” category. A few got very upset that I have been personally rude about Sue Cowley. 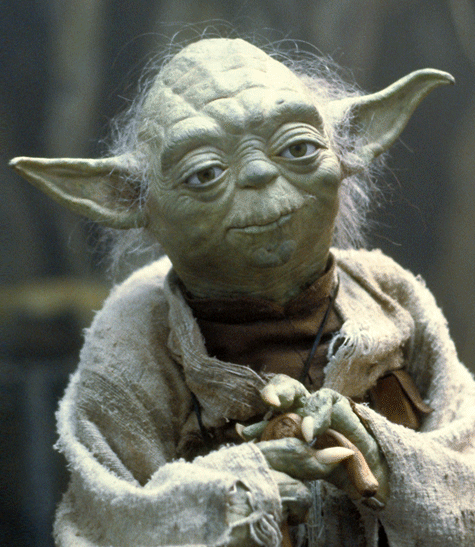 An odd line of complaint because the only criticism I made that was personal, rather than a rehash of old arguments about the merits of her behaviour advice, was where I implied she was a Dark Lord of the Sith dedicated to the conquest of the universe and the ultimate victory of the Dark Side. While this was, indeed, a grave charge to make against someone I had assumed that it would not be taken seriously, like the time I claimed Teach First were actually a satanic death cult and when I suggested that Stephen Twigg would do a good job as shadow education secretary. But just to clarify: I do not think that Sue Cowley is actually building a Death Star (or corrupting Anakin Skywalker) and I think there is only a vague possibility that she is personally responsible for the destruction of Alderaan. I will let you know if any Bothans bring me information to contradict this at a later date. I think this is all worth a quick response. I can’t really comment on Gove’s “silence” on discipline. I don’t think he has been silent, I just don’t think he has done anything effective to improve discipline. There are two points really, the first is that I think it understates the nature of her original anti-anonymous bloggers post. That post did have a more serious implication that anonymous bloggers were likely to be dishonest, something which, if you understand why we blog anonymously, seems to be the exact opposite of the reality. It is because I am anonymous that I can be honest. As for the point about what can be said about children’s behaviour, I think that it is impossible to conduct the debate about discipline in schools without acknowledging the kind of thing we often see happening. While I agree absolutely that we should make it impossible to identify individual children, too much debate on behaviour is conducted by people with no appreciation of what is actually going on. Phrases like “low level disruption” often mask the reality of classes which routinely ignore their teachers. Talk of “establishing relationships” is often used to hide a reality where teachers are hated if they actually want children to work and think rather than chat and play. To suggest that nothing be mentioned that a parent wouldn’t want known about their child, even when the child is not identified, is simply to perpetuate an education debate that is based on a world unrecognisable to so many teachers. There were some lines of criticism of my blogpost that, with hindsight I am surprised I didn’t see. I have now reflected a bit on my own arguments for anonymity. Other than the point about protecting the identities of children, I actually now think that many of my points overlapped because they were so vague. They can probably be summed up as “if I wasn’t anonymous I would be gotten” and while I gave repeated reasons why I think this, I was not terribly precise. The honest explanation is that I don’t know exactly what would happen if my identity was blown. I do, however, have plenty of reason to think it wouldn’t be good and that it would stop me from blogging in the future. And that, to me, is plenty of reason to keep my identity to myself and if people are made uncomfortable by that, I think they should give serious thought to the possibility that they are intent on making debate personal rather than about the content of arguments. As for those who accused me of bullying Sue, or for that matter those who accused me of bullying Debra Kidd when I criticised her internet campaign a few weeks back, I can only say that I love being accused of bullying by people with real power and influence in the education establishment. Any prominence I have is what they have given to me by silencing those who would speak out under their own names and in forums other than the internet. I am not victimising the upholders of educational orthodoxy, I am simply standing up to them in the one place where declaring those you agree with to be the “experts” counts for nothing. For too long those who disagree with the establishment are condemned for not being teachers, while those who disagree who are teachers are forced to keep silent. The internet and the rise of anonymous outlets for teachers have changed that. It would be great to see the freedoms we have here extended to the staffroom or to public debate, but those freedoms cannot be taken away from us here and some people need to learn to come to terms with that. You are currently browsing the Scenes From The Battleground blog archives for May, 2013.